The OMEGA™ Infrared Series is a range of high quality, low cost, compact sensors which measure the temperature of inaccessible or moving objects and materials. They measure temperatures from -20 to 500°C (-4 to 932ºF), accurately and consistently, with an outstanding response time of 240 mS. OMEGA sensors transmit the target temperature as a 4 to 20 mA output and offer a simple solution for most non-contact temperature measurement applications. The sensor’s emissivity setting can be adjusted from 0.2 to 1.0 to cope with different target materials and is controlled by a 4 to 20 mA input. This gives the opportunity to adjust the emissivity setting automatically from a programmable logic controller (PLC). 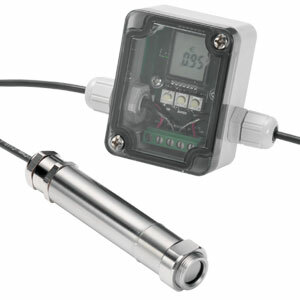 Alternatively the emissivity setting can be adjusted manually using the OS210-PT. If the 4 to 20 mA input is left open or short-circuit the emissivity setting defaults to 0.95. † Refer to accessory chart on J-3 for NIST calibration ordering information. Note: Comes complete with sensor head, 1 m (3.3') cable and operator’s manual.